One thing I love about my town is how it's okay to be unconventional. Certainly there are areas where perfect suburban lawns stretch identically to the curb, bordered by bark and carefully pruned shrubs (I remember driving up to one such location when we were house-hunting, and telling our real-estate agent to just drive away! I couldn't see myself living there). But there are lots of funky, fun parts of town where people feel free to get creative with their gardens. Many of them have lovely perennial beds, arbors spilling over with purple wisteria blossoms, and friendly patios and porches. But others have taken front-yard gardening to new heights with productive vegetable beds, even growing gorgeous cucumbers in the space betweeen sidewalk and curb. 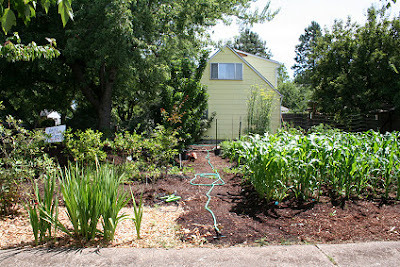 Here's a front yard with rows of corn and blueberry plants. 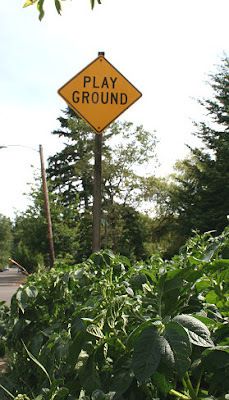 An amazing amount of produce can be grown in the space that a current front lawn takes up. I recently read an article about how the city I live in has enough farmland to completely support the produce needs of our own population. But really, we wouldn't need all that farmland for produce if people make use of the space they already have available to them. Of course, with grocery-store prices still artificially low for trucked-in food, due to still-low gas prices, people will not want to uproot their lawns for food production. But I'm betting by the time we see an explosion in food prices as gasoline doubles or triples in cost, "Grow Don't Mow" will become a new mantra for many. This is one of my favorite local house-front gardens. 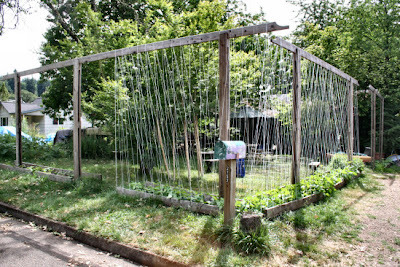 They've planted tall bean trellises in such a way that it forms an outdoor room in front of their house. It's really gorgeous - they have a picnic table inside this wonderful bean-enclosed green room. What a clever idea! 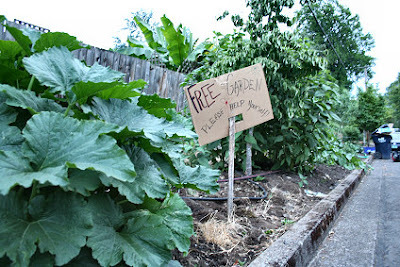 And some people even go so far as to giving away their curb-side produce for free. Talk about community-building and sharing. Isn't this awesome! Combine this with the insane number of fruit trees that are abundantly producing this year (and all the fruit rotting on the ground around the city, which is sad to see) and so many more people could be eating healthy, home-grown produce. 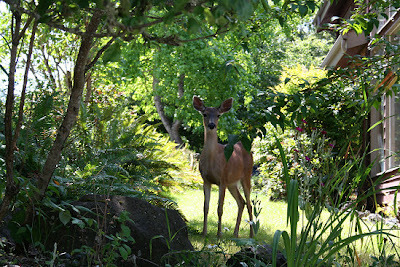 Since we live in an area of the city where deer wander boldly into our front lawns, the grow-don't-mow approach doesn't work well for the front of our house, and I'm restricted to growing perennials that the deer don't touch, plus a few assorted herbs that they don't seem to care for (fennel, chives, parseley, mint) and save our food-growing for the fenced-in back yard. So I love to wander and look at what other people down in the deer-free parts of the city are doing. - We bought honeycomb insulated blinds for more of our windows this winter, with plans to install even more of them this year. - At night, we open the blinds and all of the windows and let the cooler air wash through the house. - In the early morning, I open up all of the doors as well and really chill it down as best as we can. 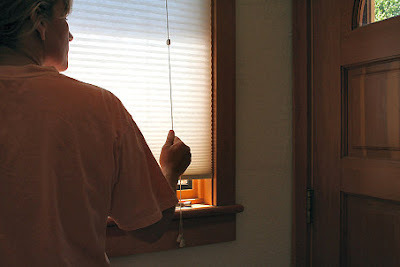 - As soon as the temperature starts rising outside, the house gets buttoned up tight and the blinds get closed. We try to be vigilant about not leaving doors open when people go in or out. - We've changed over to "siesta schedule" where we get all of our outdoor chores (laundry, gardening) done in the cooler morning and evening hours, as well as outdoor play time for the kids. From about 2 - 5 we come in and head down to the nice cool basement to watch a movie or play games. Then we're outside until 10:00 at night, enjoying the nice temperatures. - Alternative to indoor siesta is head to pool or lake or river! - When it starts cooling down in the evening and we head outdoors, we open up the house again. - Deciduous trees on the south and east sides of the house provide much cooler temperatures. The west is our only bugaboo with one big west-facing window that's not shaded by a tree (the neighbor's house is too close for us to plant one there. But we put some good shades on it this year and that has helped a lot. Though the temperature outside was 102, our house never climbed above 83 (upstairs) 78 (main floor) and a wonderful 64 in the basement! By evening, it was cool enough to sleep upstairs. Nice! So we planted too much lettuce. Way too much lettuce. My hubby ended up taking out about half of it, and then what do you do with a sink full of lettuce (and a few earwigs)? 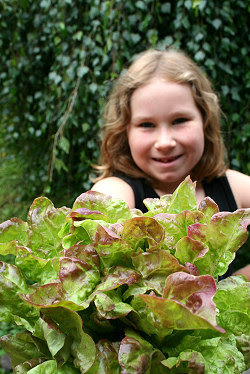 Have a Great Lettuce Giveaway, of course! Miss A. volunteered to take lettuce to everyone in the neighborhood, so I washed and bagged and she headed out on runs to the various neighbors' houses. All in all, she delivered about six or seven lettuce bundles (hey, at least it wasn't zucchini, all right?). That's one thing I really value about her, she knows how to reach out to other people. In that way, she's a lot like her dad. I've noticed that he always remembers people's names, and makes a habit of using their name in conversation, even if it is just the person at the hotel reservations desk in Dallas, Texas, I'll hear him say "Okay, thanks for helping me David". It's one of the things I really like about him and wish I could do better (well, I wish peoples' names would just stick in my head for starters. I once, famously, forgot my own manager's name at work and we had worked together for over six years at that point). But when it comes to maintaining neighborhood relationships, no one tops Miss A. We had a Solstice campfire (not big enough to really call it a bonfire), and she walked around inviting the neighbors. And I'm not just talking about kids, she'll walk over to houses with only adults and invite them over. She knows all the adults by name, and is more than happy to talk with them. As a result, we had neighbors come to our Solstice gathering that I hadn't seen in awhile and had the opportunity to catch up with what they're doing now. I think when discussions turn to sustainability that building and maintaining community is often not given the attention that it deserves. Sure, it's all the rage to think about forming an intentional community. And some of them do get formed and some of them are succesful in the long-term, which is terrific. But beyond that, for those of us who are not going to uproot and move to a created community, nurturing the relationships with the people who live close to us is important, and something we don't often take the time for. Sometimes it takes a kid to remind us of the importance of reaching out to others. Of not being embarassed to go knocking on doors. Even to hand out bunches of lettuce.